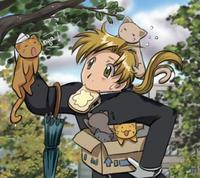 Alphonse and Kitty. . Images in the फुल मेटल ऐल्केमिस्ट club tagged: alphonse al kitty cat kitties toast fma full metal fullmetal alchemist.